Devastating floods continue to create havoc in Manipur in the past week, claiming a total of 7 lives. The devastating flood has affected 1.80 lakh people in eight districts out of 16 districts in Manipur following heavy rains. On the other hand, one person has been reported to be missing, official sources said here on Monday night. 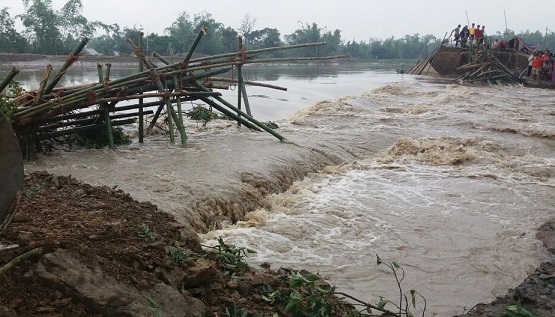 The flood has also claimed lives of 400 animals and altogether 51,689 victims from different flood affected areas were evacuated till 4 pm of Monday, said the DIPR in a press release quoting the Directorate of Relief and Disaster Management reports. It also damaged 3,947 hectares of agricultural land. Around 59,170 people are taking shelter at 174 relief camps which were opened providing assistance and distributing relief materials including essential commodities like rice, dal, edible oil, candle, mosquito coil, match boxes among others. Central and State forces were deployed for immediate assistance of the victims, says a DIPR release tonight. The total number of locality/community/village affected by the flood is recorded at 304,while 23,456 houses were damaged. “The flood situation in some parts of the State is improving although some areas are still inundated under flood water,” said the release. “The Government of Manipur is using all its machineries towards extending maximum help to the flood victims and is keeping a strict vigil to control the situation both in the hills and the valley. 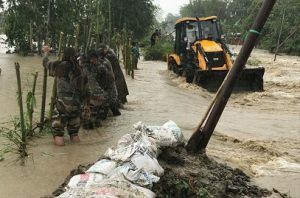 The Government on June 13, 2018 announced holiday on account of the sudden flood in the State which has affected large number of people both living in the valley and the hills,” it added. Following the incessant rainfall in the past few days, several parts of the valley and hill districts of Manipur viz. Imphal West, Imphal East, Thoubal, Bishnupur, Kakching, Kamjong, Jiribam, Churachandpur, Pherzawl and Kangpokpi were affected. During the current monsoon season, 1,80,102 population were affected in 10 districts of the State. Defence teams including Army, Indian Navy, Air Force, paramilitary forces, engineers of Assam Rifles, teams of State Disaster Response Force and State Police are also actively taking part in the relief and rescue operations while 24 medical camps are providing immediate medical assistance to the flood affected people in the State.